Labranda Targa Club Aqua Parc is set within the historic city of Marrakech, which is a vibrant and beautiful location full of old city charm and friendly faces. There are a large number of plush guest room accommodations for families and solo travellers that come equipped with all the modern conveniences, you would expect of a top quality hotel, including air-conditioning. The grounds, much like Morocco are characterised by exotic palm trees and olive trees. This four-star resort is perfect for families and couples with its excellent facilities, including a choice of restaurants to suit every palate, a traditional hammam and sports activities, such as tennis. The resort has a large swimming pool with a dedicated children’s pool area. 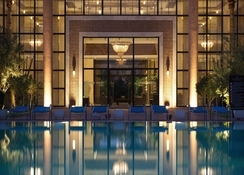 You can choose to relax at the luxury spa or enjoy an assortment of water based activities here. 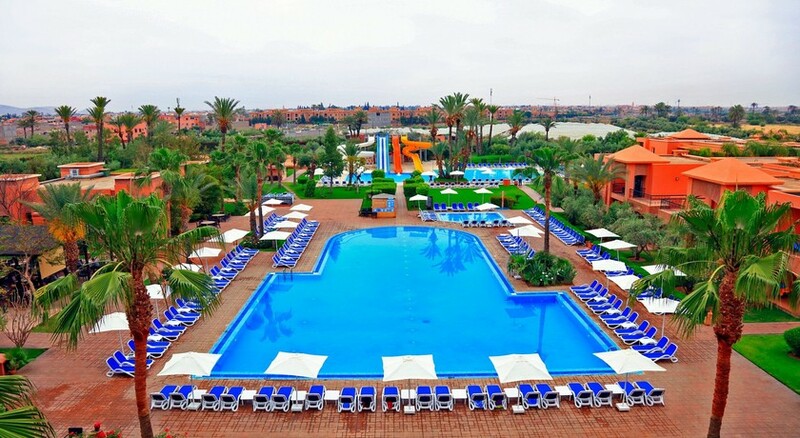 There are many flights to Marrakech from almost all the cities across Europe, which makes it convenient to visit Labranda Aqua Park Marrakech. Labranda Targa Club Aqua Parc is just a few minutes’ walk from numerous excellent restaurants and shopping stop-offs. Further towards the city centre you'll find a great collection of restaurants serving French cuisine and French inspired food as a throwback to its historical ties with France. 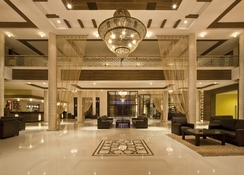 Guests can board flights from Marrakech airport on time, as it is only 11 km away from the hotel. The smartly-appointed guest rooms at Labranda Targa Club Aqua Parc are well-furnished with excellent facilities. They feature Wi-Fi internet access, seasonal air-conditioning, desk and an exceptionally comfortable bed – all housed within a contemporary design. Many rooms are available with a private balcony affording guests great views across Marrakech. Room options include single, double or twin rooms, as well as a spacious Suite, Family Room and Family Studio. 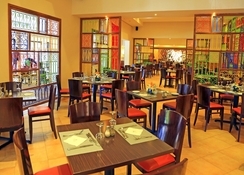 The main L’Orangeraie restaurant serves a variety of dishes suitable for varying tastes. Other than this, there are international and themed buffets. There are several bars available; the salon bar is equipped with big screens, while at the bars by the pool you can pick up snacks and choose from a great selection of beers, wines and spirits. Guests can also dine in traditional Morrocan-style at the Labranda Targa Club Aquapark’s a la carte restaurant. The perfect location to relax and unwind, Labranda Aqua Park in Marrakech features an array of excellent sports and leisure facilities. These include a large swimming pool, playground for children, and a spa and wellness centre offering massage treatments and amenities such as a hammam, a hot tub and a Jacuzzi. Activities at Labranda Targa Club Aquapark include a mini-club and playground for children and a gymnasium, a snooker table, tennis, table tennis, sauna, darts and a disco. 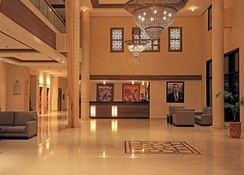 Excellent hotel- very lovely friendly staff, exceptionally clean rooms and pool area, easy access to Medina and Souks, air-conditioned bus for tours, helpful reception desk. First proper holiday and the hotel was what made it even more perfect!! Every single thing for me was perfect and the staff are out of this world!! so nice people I have never met such beautiful, amazing people, since I have come back all I'm thinking about is when will I go back!! For me and my family everything I needed that was not there and it was delivered to me, the only thing I think they should on improve on is an Iron in the bedroom, had to ask for one each day so was a little pain, but I can bear the pain for that as I will most definetaly be going back. There was a amazing receptionist there called Zainab, she is someone I think I will remember her for life, she was one amazing and loving person who helped me a lot throughout my stay and than there was one amazing chef called BADR and he every morning made me a omelette and in the week he picked up what I liked and disliked, I felt like I was with my own family, he was just out of this world, I have to say coming back home and settling back in after the stay, I have missed them all so very much. thank you for making my first ever holiday so memorable and I will return!! Labranda Targa Aqua Park excelent! Excelent hotel! And facilities aswell! Been to Morocco a few times. This is a brilliant place to stay. Its a bit far out but that is negated by the free shuttle that takes you into the city. The pool is great, and the room was nice and functional. The food is great too. We had a fantastic time here last year. It was June when we visited and extremely hot! The facilities were great all the staff were friendly and helpful and the choice of food was fantastic. There was always lots of choice and plenty of opportunity to see your food being cooked in front of you. We would definitely go back!